Each year Hartwell Parish Council receives complaints from worried and sometimes angry parishioners about the amount of dog faeces left around the village. Animal faeces are unhygienic and a health hazard. We can generally avoid direct contact and therefore minimise the risk of becoming ill. However, there are times when it's more difficult to avoid, for example, when pushing a pram or playing in a park where dogs have fouled and the person walking the dog has not cleaned up after them. So, please pick up after your dog and if you are walking in the dark remember to take a torch as well as some bags. 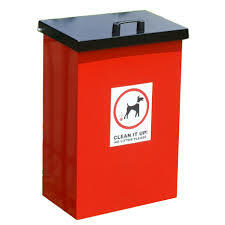 There are seven red dog bins in the village and in the absence of a dog bin please use one of the black litter bins or take your bag of poo home with you and put it into your black Sulo bin. Remember, if a council officer or any other authorised officer witnesses you not cleaning up after your dog, you may be given a fixed penalty of £75. If you refuse to pay the fixed penalty you may be taken to court and be fined up to £1000 plus court costs.